This is why they are included in their own kingdom which in some ways is closer to animals than plants. For example insect and other arthropod skeletons are made of chitin. A single fungal filament is called a hypha (plural hyphae). The chitin cell wall encloses a cytoplasm that may be undivided (Zygomycetes - molds), partially divided by perforated cross-walls (Ascomycetes - morels, cup fungi, blue molds) or fully divided (Basidiomycetes - mushrooms). The cytoplasm contains one or more haploid nuclei. If there are no cross-walls the cell structure is is said to be "coenocytic". Many basidiomycetes have hyphae built up of uninucleate cells. The yeasts are exceptional among the Ascomycetes in that they are usually uninucleate and unicellular (non-filamentous). Hyphae grow at their tips and branch to form a mass of interwoven strands that is called mycelium. This is a culture of Pythium isolated from Taxus. 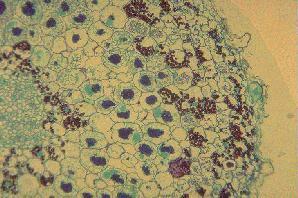 In many fungi the mycelium will form special structures in which nuclei will fuse to form diploid cells. These undergo meiosis to form haploid spores which can be transported over huge distances. Some fungi, particularly yeasts exist predominantly as single cells and never form large fruiting bodies. For some reason human fungal diseases (like yeast infections, toenail fungus and athletes foot) have become more common in recent years. However it is probably true to say that we suffer from more viral and bacterial diseases than fungal. It is the other way round with plants; fungi cause many more diseases and losses from these diseases are worse than for bacteria and viruses. Fungal pathogens can get past the plant's defenses more readily than the other organisms. Their hyphae produce enzymes that can digest both plant cuticle and cell walls so that they can penetrate the surface and the internal tissues of healthy plants. Chemical control of fungal diseases has a long history, starting with inorganic compounds such as copper salts and lime-sulfur in the nineteenth century and ending with sophisticated organic compounds such as imidazoles and triazoles in the 1970s and 80s. The inorganic compounds can be genuinely fungicidal (and phytotoxic), whereas the organic compounds are more selective but only fungistatic. Some crops cannot be grown without fungicides, particularly in damp climates (like Ohio) but public opposition to their use is making it difficult to continue spraying. As with bacteria we are having to control fungi by ecological approaches. ectomycorrhizae that form a sheath of mycelium around the root and often occur in woody plants. It seems that just about any kind of plant can form a mycorrhizal association; they do not often occur in agricultural crops and we usually have to make sure that these have plenty of nutrients from artificial sources. Many coniferous trees just do not grow well in the absence of suitable mycorrhizal fungi and most orchids have an absolute requirement for their fungal partners.